Another idea borrowed from Deborah Madison. I made this frittata last night - it's based loosely on her Onion Omelet with Vinegar and Walnuts. It sounded too heavy with filling to me the way it was written, so I adjusted the quantities, changed the herb seasoning and simplified the thing into an easy Sunday supper. Slice 1 medium yellow onion thickly, chop up fresh tarragon leaves to equal about a teaspoon, and heat the oven to 375 degrees F.
Melt about 2 teaspoons butter in a 10" ovenproof non-stick skillet. Toss in a small handful of walnut pieces, season with salt and pepper and cook them over medium heat until lightly toasted. Pour out the walnuts and browned butter onto a plate. Add enough olive oil (1 tbsp?) to the skillet to cook the onion slices. Cook and stir the onions over medium heat until they start to brown, then add a splash of sherry vinegar (a very small amount - 1/4 to 1/2 tsp.) Season with salt and pepper. Beat 4 eggs and add to the skillet (with the onions still in it). Sprinkle with the chopped tarragon and top with the walnuts, drizzling as much of the browned butter on top as possible. Cook the frittata in the preheated oven until the eggs are set. Cut into wedges and serve. Roasted potatoes with rosemary makes a nice accompaniment. When I hear "Salsa Verde" I think of tomatillos and green chiles, but Deborah Madison's Salsa Verde has nothing to do with hot peppers. This is a versatile olive oil-based condiment, thick with parsley, and very adaptable. So adaptable in fact, that she's included a different version of it in all three of her cookbooks on my shelf. The common ingredients in all the recipes are olive oil, parsley, garlic, and capers. 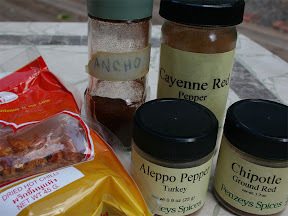 This sauce is good on just about everything, and I could sit down and eat it with a spoon, but try it on scrambled eggs, or boiled potatoes, or spread on bread with a slice of cheese. I don't want to copy published recipes here but others feel no such scruples, so if you do an internet search for Deborah Madison and Salsa Verde you should come up with enough information to make this sauce. Inspired by Ki's post about his chile pepper obsession, I decided to check my kitchen to see how many chile-containing items I had on hand. I think Ki wins. He definitely wins in the hot sauce category, as I only could find two. 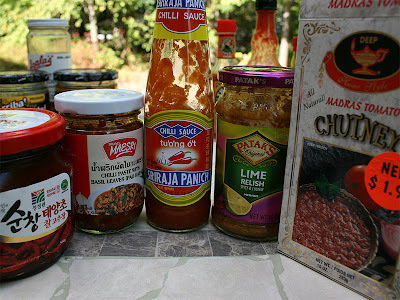 Most of our chiles are to be found in other condiments - salsa, pickles etc. And very few of these have seen the light of day since the garden started producing peppers and tomatoes this summer. But when the last of those have been consumed we'll be back to our favorite commercial products. Here we have, left to right, Korean chile paste, Thai chile paste with basil, Sriracha sauce (spelled Sriraja here), Indian lime relish, and Indian tomato chutney. I use the Korean chile paste as the base for a chicken wing sauce, and I've never used it for anything else. The Thai chile paste used to be the seasoning for chile-and-basil stir fries, until I concocted my own recipe this summer. Sriracha gets added to a lot of things when I want a little extra zip, but we use it most often to create a spicy ketchup (half ketchup, half Sriracha), and also mix it with mayonnaise to make a sauce for crab cakes (better than tartar sauce). Indian pickles, relishes and chutneys are all used as zesty palate-refresher side dishes, served in small portions along with the rest of the meal. Leaving Asia, and coming to North America, we have Scala's Hot Giardiniera, Arriba's Green and Red Salsas, a couple of chile vinegars, and Frank's Hot Sauce. Scala's Hot Giardiniera is a product that, as far as I know, is unique to Chicago. I know we've searched for a suitable replacement in Virginia and not found it. There are other giardinieras, but they are not the same thing. So we buy it in northern Illinois when we're there. It's mostly sport peppers, and a few other vegetables (celery, carrot, olives), preserved in oil. We normally serve it alongside sandwiches (Italian Beef, another Chicago thing) or maybe with just bread and cheese. 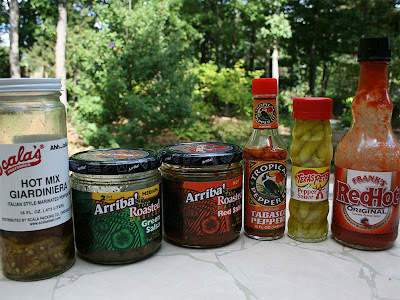 Arriba's Salsas are just about the only jarred ones I buy. We've tried others, but always come back to Arriba. We only wish we could get the hot version of green one, but don't know of anyone selling it locally anymore. Chile vinegars get added to dishes in the same way I use Sriracha, when I need an extra little something. I top off the bottles with rice vinegar when they get low and these bottles last a long time. This year I'm planning to make my own with the Bellingrath Gardens Purple peppers. Frank's Hot Sauce is put on chicken wings and nowhere else. I make chicken wings in three styles - Korean, Thai, and Buffalo. Frank's is for the Buffalo version. 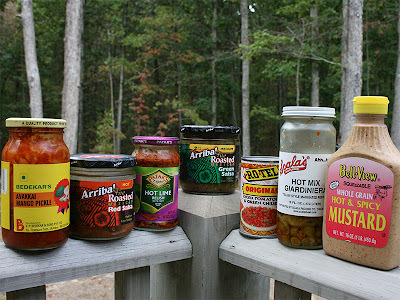 We'd hate to be without chiles in any place we occupy, even part-time, so the country fridge also yields up a few jars. You'll notice a lot of duplication here. 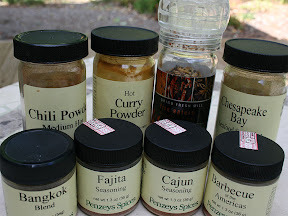 I thought, well surely this can't be all the chiles in the kitchen, so I broadened the search to the spice cupboard. I realize this looks like an ad for Penzey's but believe me, all the money in this relationship flows in one direction - me to them; I'm just a satisfied customer. We munch on chile snacks too. 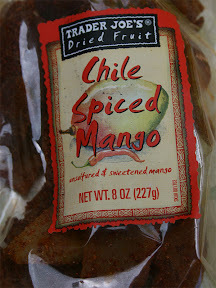 We usually have these chile-flavored mango slices in the pantry. The newer packages in the stores look different - not as red - which leads me to believe that we're not going to like the new version. When I saw the new ones I grabbed all the old packages I could find on the shelves, so we're well stocked for the time being. I don't have any Mama Zuma Reds at the moment. Those are very hot, almost too hot - the spouse and I usually share a snack-size bag, and that's plenty. Sometimes we mix them with the plain salted ones. 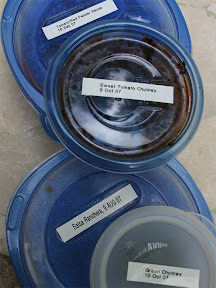 My cheap plastic containers are nowhere near as photogenic as the flashy commercial packaging, but here are several things I made with our homegrown chiles. These are in the freezer now, destined to warm up our winter nights. Does anybody else reading this have a chile collection? I'd love to see it. This is an Indianish recipe from the August issue of Sunset magazine. 'Thai Pink' tomatoes are absolutely perfect here, but I bet they suggested larger tomatoes because they didn't want to frighten away those who may not want to peel a zillion tomatoes. OK, not a zillion - just 18 or so. We liked this dish a lot, but I didn't make it as written. I think they have too many cumin seeds, too much garlic, and too much butter. My changes are as follows: 1 tsp. cumin seeds, 2 tsp. brown mustard seeds, 3 cloves of garlic, 1 tbsp. butter, and a generous 1/2 tsp. Japanese sea salt. And I didn't seed the chile peppers. And of course, I substituted 'Thai Pink' tomatoes instead of 'Early Girl'. Also, unless you have very fresh yogurt, it will probably curdle on you. I'd suggest stabilizing the yogurt with cornstarch first - a trick I learned from Claudia Roden's A Book of Middle Eastern Food. For 1 cup of yogurt, mix about 1/2 tsp cornstarch with a little cold water to make a thin paste. Beat the yogurt in a saucepan, and add the cornstarch paste and a pinch of salt. Stirring constantly, bring the yogurt to a boil over medium-low heat and then reduce the heat and simmer for 10 minutes until thickened and smooth. Now, I must confess that I didn't actually do this. I made the recipe 3 times; the first time it cooked beautifully with no curdling, the second time it curdled horribly, and the third time it was somewhere in between. The next time I make it, I'm not taking chances. I initially served this with lamb burgers (seasoned with garlic/ginger/chile paste and curry powder). Both the spouse and I thought the combination tasted something like the Turkish Yogurtlu Kebab, as an Indian cook might make it. The second and third times I served it as part of an Indian vegetarian meal. We liked it either way.